The first international serial will be filmed in Kyiv with the involvement of a team of cinema makers of the world level together with a group from 1+1 Media, Kyiv's mayor Vitali Klitschko has announced. "Dear friends, Kyiv is becoming a European movie set for cinema making. Well-known European and U.S. producers and scriptwriters together with a group from 1+1 Media will shoot the first international serial in our city," Klitschko wrote in a post on Facebook on November 12. He said the project is planned for distribution by one of the international streaming platforms. "The shooting of the pilot episode is starting in Kyiv on November 13. Today a memorandum on such cooperation was signed at the Royal Norwegian embassy in Ukraine. I am thankful to H.E. Ambassador of the Kingdom of Norway to Ukraine Ole Horpestad for supporting this project. On its part, our city will provide all the necessary support and assistance," the mayor of Kyiv said. The project will involve a team of U.S. and Norwegian scriptwriters and producers. The shooting will be done by Norwegian company Evil Doghouse Production together with Ukrainian company 1+1 Production. The serial named Jonathan Fort will tell the story of the life of a former boxer who gets a new and dangerous job at the Royal Norwegian embassy in Ukraine. About 80% of the storyline will be shot in Kyiv and Odesa. "Today international stars shoot their clips in the Ukrainian capital, large international companies shoot their ads, and the world learns more about Kyiv. As a result, we get more tourists. And we continue to develop the tourist infrastructure in the capital by creating beautiful locations. 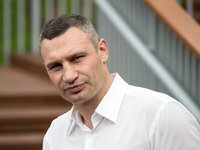 Because all of this goes for the benefit of our city," Klitschko said.